The simplest way to describe Heidelberg’s Primefire 106 digital inkjet production press is to point out that except for the inkjet engine behind glass doors in the middle of the device, it’s essentially a Speedmaster XL106 – Heidelberg’s top-of-the-line offset lithographic platform. 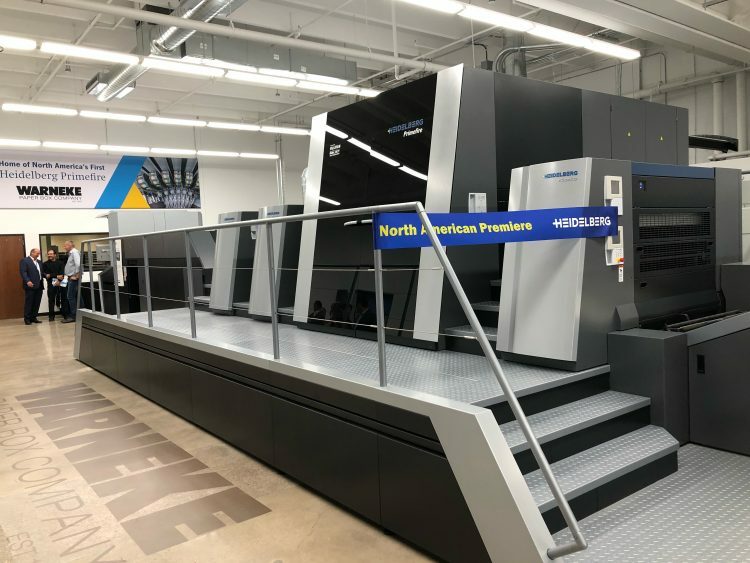 The similarity “is one of the things that resonates with our customers the most – it looks like a press,” says Dan Maurer, VP of digital product management for Heidelberg North America. At the Warneke-Heidelberg event, he detailed the Primefire 106’s familiar elements as well as its breakthrough technologies, explaining how the features are expected to contribute to the overall effectiveness of the equipment. A major carryover from the Speedmaster XL 106 is the Primefire 106’s Preset Plus feeder, which automates the air and format settings that the machine’s B1-plus (29.53” x 41.73”) sheet size entails. Maurer said that although the press also can feed sheets down to 18.5” x 18.9”, it’s unlikely that Primefire 106 users will want to run it with anything less than full-sized layouts. Heidelberg is projecting at least 80% available print uptime for the press, which doesn’t require a climate controlled pressroom to operate in (although temperature and humidity in its environments probably will be regulated for the sake of the paper). Its 2,500 sheets-per-hour running speed will increase in future upgrades that will be retrofittable to Warneke’s press and other initial installs, Maurer said. The Primefire 106 is a simplex press that prints in seven colors of aqueous ink – CMYK plus green, orange, and violet – at a native resolution of 1,200 x 1,200 dpi by virtue of a jetting unit supplied by Fujifilm Inkjet Technologies (a Heidelberg partner in previous inkjet ventures). Heidelberg says that thanks to its expanded color space, the press can match 95% of the Pantone gamut with a ∆E variation of less than 2. The Primefire 106 presently can handle coated packaging stocks in thicknesses from 8 pt. to 24 pt. (0.2 to 0.6 mm). Uncoated boards and textured stocks also are eligible. Maurer said that over time, Heidelberg engineers will qualify more types of stocks for the press, which presents substrates to the jetting unit on a four-ton cylinder with front and rear grippers. A conditioning unit between the feeder and the inkjet cabinet pre-treats stocks with a mixture of water and phosphoric acid (a coagulant used in soft drinks and food). The primer, applied to the full printable surface with an anilox roller, pin-cures the jetted ink and enables water to wick out of the sheet, according to Maurer. The primer and ink, along with water-based and UV coatings laid down after printing, are Saphira brand consumables from Heidelberg, optimized for the Primefire 106 in conjunction with Fujifilm. Drying can be a combination of hot air, infrared, and conventional UV (the press at Warneke has all three). At the control console, Heidelberg’s Prinect Digital Center Inline technology integrates all functions of the press and displays their status on an oversized wall screen. In a demonstration during the premier event, the screen showed highly magnified images of test prints with type as small as 1 pt. dropping cleanly out of a seven-color black background – a feat of reproduction all but impossible to achieve on a conventional litho press.